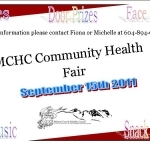 Mount Currie Health Centre Health Fair! September 15th starting at 3pm. For more information call Fiona or Michelle at 604-894-6656.